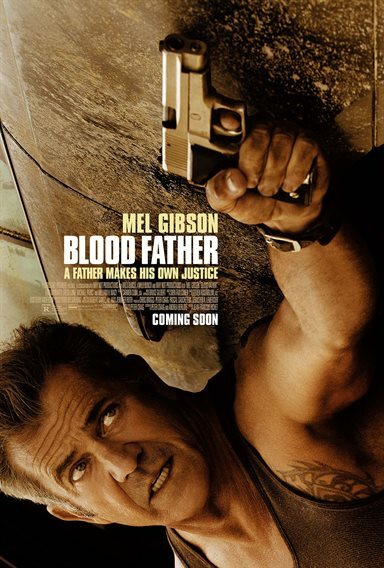 Download Blood Father in Digital HD from the iTunes store. Blood Father images are © Lionsgate. All Rights Reserved. Everyone is familiar with the phrase "daddy's little girl". Usually, it is described when a dad loves his daughter so much he will do almost anything for her. However, when dad is a convicted felon who spent 9 years in jail while his daughter was raise by three different stepdads and the daughter is a 17 year old runaway who shot and killed her drug cartel boyfriend, there is a somewhat different dynamic to their relationship. Interestingly, in Blood Father there still seems to be an element of the "Daddy's little girl" underlying the plot. John Link (Mel Gibson; Braveheart) has been out of jail for a few years and is a recovering alcoholic living and working in a trailer park in the western part of the United States. When he suddenly gets a frantic phone call from his estranged daughter, Lydia (Erin Moriarty; Jessica Jones), asking for money and help, he immediately breaks parole and drives to pick her up. Ending up back at his trailer, they are met by three seemingly gang members looking for revenge on Lydia. Suddenly father and daughter, practically strangers, find themselves on the run, not only from the cartel, but, from law enforcement as well. As they enlist the help of John's friends, Lydia learns more about her father and the type of person he used to be and John learns more about who wants Lydia dead and why. As things draw to an end, John will risk his life for Lydia and she won't leave his side making their formerly absent bond strong and solid. 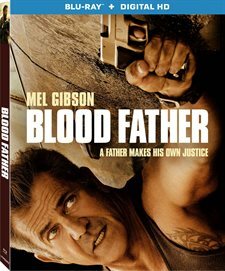 Gibson has had a rough time of it personally in the last several years, leading to few acting roles, but Blood Father reminds us why he has had longevity in a career that chews people up and spits them out more often than not. He is the perfect combination of hard as nails criminal blended with the father that will do anything to protect his little girl no matter how old she gets. Moriarty is good next to Gibson, but I couldn't help comparing her to Selena Gomez in looks, voice and mannerisms. Frankly, it got a little annoying at times. The supporting cast including William H. Macy (Shameless) and Diego Luna (Elysium) only serve to enhance the leads. Director Jean-Francios Richet (Mesrine Part 1 and 2) does a great job with Peter Craig's (The Town) work, keeping the film at a steady pace while setting the scenes methodically and thoroughly. The story isn't confusing or convoluted, and keeps the audience engaged from start to finish. There aren't any lulls or superfluous scenes. The Blu-ray has a 1080p resolution with 2.39:1 aspect ratio, which is a pleasure to watch. The bright sun in the desert is blinding, while the black hues of nighttime are deep and rich. The audio mix was annoying at times because the dialog was much softer than the action sequences but the DTS-HD Master Audio 5.1 was sharp and every gunshot was clear with plenty of reverberation. The disc has only one extra, a 27 minute long featurette entitled "Lost Souls: On the Road with Blood Father". It is basically almost 30 minutes of the cast and crew awkwardly gushing about each other ad nausea. While some of the sentiments seemed genuine, others were delivered with stiff and stilted speech, which made it rather unbelievable. What originally seemed like a worn out idea from the outside ended up being a terrific story with heart and action and a great performance by Gibson (not as good as Braveheart but strong nonetheless). Blood Father is a solid piece of filmmaking where all the elements – cast, script and director - came together to deliver a quality product.